Nitin Mechanical Works Pvt. Ltd. 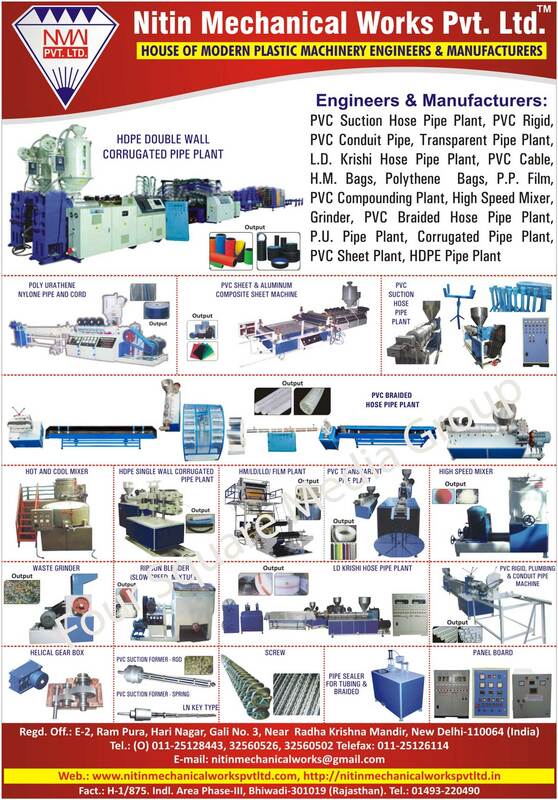 Plastic Machines, PVC Suction Hose Pipe Plants, PVC Rigid Pipe Plants, PVC Conduit Pipes, Plants, Transparent Pipe Plants, LD Krishi Hose Pipe Plants, LD Agricultural Pipe Plants, PVC Cable Plants, HM Bag Plants, Polythene Bag Plants, PP Film Plants, PVC Compounding Plants, High Speed Mixers, Plastic Grinders, PVC Braided Hose Pipe Plants, PU Pipe Plants, Corrugated Pipe Plants, PVC Sheet Plants, HDPE Pipe Plants, HDPE Double Wall Corrugated Pipe Plants, Aluminium Composite Sheet Machines, Hot and Cool Mixers, HDPE Single Wall Corrugated Pipe Plants, HM Film Plants, LD Film Plants, LLD Film Plants, PVC Transparent Pipe Plants, Waste Grinders, Scrap Grinders, Slow Speed Mixture, Ribbon Blenders, PVC Rigid Pipe Machines, Plumbing Pipe Machines, Conduit Pipe Machines, Helical Gear Boxes, ROD PVC Suction Formers, Spring LN Key Type PVC Suction Formers, Screws, Pipe Sealer For Tubings, Pipe Sealer For Braided, Panel Boards, PVC Sheet Composite Sheet Machines, Poly Urathene Nylone Pipe, Poly Urathene Nylone Cord, Conduit Pipe Machines as an active Manufacturer, Supplier, Dealer, Distributor, Trader and Seller etc. (*Importer/Exporter/Service Provider).